Recently I’ve been wanting to acquire two things. Both are probably due to what is termed a “mid-life crisis” (my Hebrew birthday was the 21st of Kislev and will be falling out in a few days) and attempting to recapture my youth. First, I am ready to start driving a “Smokey and the Bandit” Trans Am and I want to start sporting a goatee, instead of my short beard. It’s high time that I shake things up with my image. Just kidding. Now I’ll be serious. Firstly I’ve been thinking about growing my bangs out. 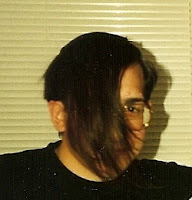 I had rockin’ bangs in the late 80s and I think that it’d feel younger with something hanging down over my forehead. It really won’t happen because I have no interest in that “in between” stage of waiting for bangs (been there, grown that). Secondly, as I’ve jokingly told my wife and a few friends, been think of getting the band back together. Of course, that would be the band that I never had. Two days before Chanukka I felt an urge to buy a guitar and start taking lessons. I, once upon at time, from first through fourth grade played guitar. Due to a geographic move I wasn’t able to continue. At the suggestion of a good friend I decided to sit on this urge and see if it’s a real desire or just a fleeting idea. I’m still sitting. However, the initial catalyst is that I know that it shows a lack of middos on my part to just sit and complain about not finding J-music that I like and I’d rather be pro-active and just make my own. There are a nice amount of frum musicians in Chicago and if motivated I’m sure I could cold call a few and ask if they want to join my band that I don’t have. Then we could play the music I have in my head and the seven odd songs that I haven’t written yet (but know the pasukim/phrases that would make up the lyrics). I would convince my closest friend here to play drums and I would sing, maybe strum guitar (if I take lessons), or play my instrument of choice…the slide whistle. Ok, these are only ideas. Nothing is set in stone. Speaking of which, I was thinking about “Even Shelayma” as a band name, since it has that “rock” thing (and is also the name of a sefer containing idea’s by the GRA), but it’s to similar to Evën Sh’siyah. I can totally see the band that I don’t have performing at the Chicago Jewish Music festival (held every three years) or even playing a gig at someone’s Purim seudah. Of course all merch for band would be available from cafepress.com and I could even make some bumperstickes that say: If you don’t like my driving then go against the system and purchase a song by the band (fill in name of band here) on iTunes. While the music would be rather fast paced with emphasis on base, guitar, and drums with catchy harmonies, the pasukim and lyrics would resonate with the thinking Jew (or the Jew who isn’t even aware that they need to be thinking) that wishes to be passionate about their Avodah and relationship with Hashem and those around them. I don’t think any tracks would be vehicles for kiruv (like Journeys’ “Conversation in the Womb”), but you never know. I sort of imagine songs that you would want to crank up when driving in the snow during carpool, yet melodic enough that you can slow them down and sing them as niggunim at the Shabbos table or after havdalah, to start out the week pumped and ready for action. Maybe I’ll even start singing a little this week after havdalah. I always tell my son a short short mussar idea, usually from R Yisrael Salanter, so to add a niggun for another 30 seconds couldn’t hurt. I don’t think the band would be invited to any gigs in day schools, since our music wouldn’t sound traditionally Jewish (unless we sang acapella, then anything goes). I also don’t think we would make a video and put it on You Tube, I’ll leave that for the Maccabeats and other boy bands who would have more universal appeal. For sure we would not get booked for late night talk shows or multi-day music festivals, since Mattisyahu seems to have that covered quite well and affectively (I might add). We’ll probably only play in someone’s basement or the social hall of a shul somewhere. Maybe if we get a following (as in people related to those in the band) we could even get booked at a local restaurant. That would be super-sweet, especially if I can work out arrangements for the band to get unlimited Coke or Diet Mountain Dew. I guess that when the band that I don’t have finally forms and starts playing, then we will only have one true way to see if we’ve made it. The true tell-all sign of our success will be if we get banned and an article appears on Yeshiva World News, Matzav, and VIN about how our music is an affront to Emunas HaChamim and listening to us is far worse than not allowing internet in your home (but letting your teens have a cell phone with unsupervised web access). Is it a dream? Probably. 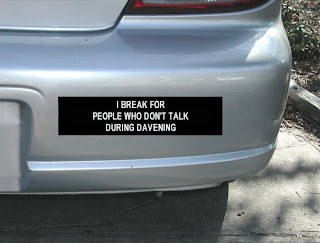 This entry was posted in bumper stickers, Chicago, humor, music, Mussar, personal on December 16, 2010 by Neil Harris. I happen to like things that allow limited space for a given message, like t-shirts and bumperstickers. On Wednesday I saw a brilliant T-shirt. It captured an import foundation in personal growth. Rav Yerucham Levovitz zt”l, the Mashgiach from the Mir (and a talmud of the Alter of Kelm, the Alter of Slobodka, and the Chofetz Chaim) said, “Woe to a person who is not aware of his faults, for he does not know what he has to correct. But double woe to a person who is not aware of his virtues, for he is lacking the tools for correcting himself“. What the Mashigach is saying is that if you don’t know exactly what your good points are, then you are lost. Without knowing exactly what those good points are, the things you excell at and make you who you are, then you can’t get anywhere. When one reaches Elul, ok when I reach Elul, I usually attempt to figure out what I didn’t work on so much during the year. I look at my Cheshbon HaNefesh (I actually keep one online at http://www.joesgoals.com) and see what my “issues” and things I was struggling with were during the year and where I fell short. R Yerucham’s approach seems different. By focusing on our virtues we not only build up our confidence, but also become more aware of exactly what gifts Hashem decided to specifically give us. This idea is very in tune with the whole “Galus HaAdom” approach of Slobodka, finding the greatness within. I think that using Elul as a time to bring out my strengths can only help me. Usually my Elul is sort of a cannonball into a pool of introspection followed by endless laps by way of the Tikun HaMiddos stroke. Using what virtues I might have to augment those things that I’m weak in brings me to the T-shirt. Each of us has a “virture” or something that we are fairly good at. If you don’t want to feel like a baal guyvah, then just accept that someone close to you feels that you are probably good at something. Our goal is of figure it out and use that as a springboard in other areas. 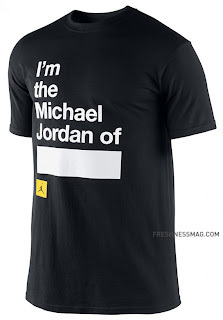 Look at the T-Shirt below and think about how you would fill in the blank. 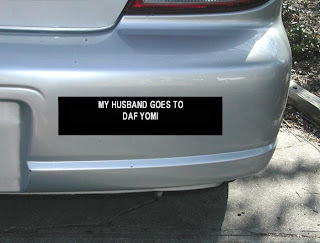 This entry was posted in bumper stickers, Chofetz Chaim, Elul, growth, lessons, Mussar on August 13, 2010 by Neil Harris. A few weeks ago I went to a big shopping mall in a suburb of Chicago with my family. Among the many kiosks there I found a “Kabbalah Kiosk”. Like any given kiosk you see in a mall these days, this one was run by several citizens from Israel who had come to America to attempt to make some money. This one has lots of charms, mezzuzah covers, earrings, necklesses, rings, pictures, ect depicting things like the Ten Sefirot, several Hebrew phrases, and other such Kabbalah items (although they didn’t sell these albums). The young adults selling the items were from Tel Aviv and Yerushalyim, both of them seemed nice. After walking away I thought of that article in the Forward, titled “The Path of the Just: Is Mussar the new Kabbalah?”. Would there ever be such a thing as a “Mussar Kiosk” in a shopping mall? I doubt it, but if there was, then the kiosk would probably be very hard to find in the mall, as most Baalei Mussar tended to stay away from the spot-light and not reveal themselves. It would be in a place that you might have to walk past once or twice before noticing it. They would most likely sell all of the products from the Chofetz Chaim Heritage Foundation, such as bookmarks, posters, tapes and cds. You would be able to by cool things like micro-sized copies of Mesillas Yesharim and Orchos Tzadikim with keychains attached to them. Or even MP3s and ebooks of Mussar seforim. They might have small “Tefillin mirrors” with the words “Mussar starts here” printed on them. Paperweights that look like buckets of water to remind people the story about when the Chofetz Chaim was a boy and while other kids thought it would be funny to freeze the water in the buckets for the local water carrier, young Yisrael Meir would empty the buckets as chessed to the water carrier. Hot coffee and latkes would be available to remind visitors that when Rav Dessler was little boy he use to get up early on Shabbos to learn with his Rebbe before davening. His mother would have hot coffee and tasty latkes (probably small cakes) waiting for him when he got out of bed. While the ikar of getting up was to learn, he himself writes that because of what his mother had waiting for he, he “got out of bed quicker”. This was an example of “Sh’lo lishma, bo lishma”. They would, for sure, sell the trash can that I have dreamed about, based on the awesome trash cans they had in the Alter of Kelm’s Talmud Torah. These trash cans were designed to be very narrow at the bottom and wide at the top (sort of like an inverted cone). If you were not careful in how you put your trash into it, it would tip over. They were designed to teach the talmidim that each action, even throwing garbage away, has an effect. 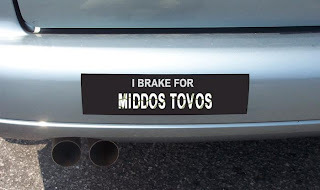 You could buy bumperstickers that would say: “I break for Midos Tovos”, “Bein Adom L’Chavero on board”, “If I’m driving to slow, then you might want to work on your Savlanut”, “My other car is a Beis HaMussar”, “Honk if you did Teshuva”, and “If I’m driving too fast, it’s becuase I’m working on the midah of Zerizus”. Again, I doubt if items a kiosk like this would ever end up in a mall, but I’d love to work there and I’d be smiling big time if someone came over to ask if we sold hammers, as a reference to this Mussar exercise. This entry was posted in bumper stickers, Chicago, Chofetz Chaim, coffee, Dessler, humor, Mussar on May 29, 2008 by Neil Harris.